Is this the end of the car key? 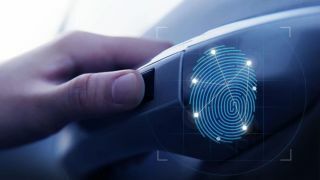 You will soon be able to buy cars which fingerprint readers built in, allowing you to unlock doors and start the engine. Hyundai has announced that the technology will be initially available on its 2019 Santa Fe SUV, although it will only offer this particular feature in (yet unknown) select markets in the first quarter of 2019 before making it more widely available. Fingerprint sensors are located on door handles and on the ignition button, and Hyundai says it's much more secure than a traditional car key. The firm says the chance of mistaking another person's fingerprint as the actual driver's is 1 in 50,000, making it five times more effective than conventional vehicle keys, including smart keys. The more the sensor is used, the better it will get at detecting the driver's digits and ensuring it is them who is attempting to access the vehicle. The unlock and engine start features are just a couple of benefits of the fingerprint technology, as it can also be used to create profiles for different users. This allows the vehicle to automatically adjust seating positions, connected car features and side-view mirror angles to fit a particular driver's requirements. Hyundai's Head of Research & Development Division, Albert Biermann said that there are "plans to further expand the application of the technology to allow the adjustment of temperature, steering wheel position, and many other features which will be tailored to driver's preferences." It's not clear yet whether the technology will be a standard feature, or a (potentially pricey) optional extra, but we should know more information soon.